According to Randy Frost and Gail Steketee, co-authors of Stuff: Compulsive Hoarding and the Meaning of Things, hoarding massive amounts of irrelevant objects dates back to the 14th century. Within the last several years hoarders have reluctantly taken their place in the national spotlight with tell-all documentary series like A&E’s Hoarders. After so many decades and centuries of shamefully hiding behind their heaps of mess, hoarders have yet to find solace in knowing there may be a cure for their condition. That may be changing soon. In May, the American Psychiatric Association is expected to releases its 5th edition of the Diagnostic and Statistical Manual of Mental Disorders, officially recognizing hoarding as a psychiatric disorder. 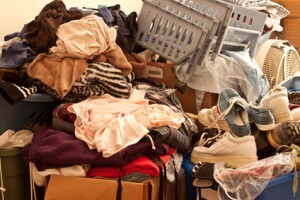 About five out of every 100 people are prone to hoarding. The home decluttering experts at Address Our Mess routinely help hoarders and “senile squalors” cope with the disorder. Their research shows that the majority of hoarders are men over the age of 40, a finding consistent with a report released by Vancouver’s new Hoarding Action Response Team, which found that most hoarders are elderly, and 62% are men. Address our Mess finds that women are more likely to seek help either for themselves or for a loved one. Therefore the rate of a successful transition to a healthier lifestyle is higher with women than men. It has also been noted by Address Our Mess experts that the hoarding condition is usually brought on after a traumatic event like death of a loved one, loss of a job, or eviction from a home. The condition gradually gets worse as time progresses. A catastrophic fire that claimed the life of a man who firefighters found alive but were unable to reach due to the clutter in the home serves as a grim reminder to landlords just how dangerous hoarding can be to the tenant, his or her neighbours, and the property. Blocked exits, pest infestations and noxious smells are common concerns. If landlords and property managers wish to avoid the problems associated with hoarding, they need to understand that careful tenant screening is their best defense. That includes speaking with the current and former landlords to determine if such problems surfaced in the past. Landlords must also conduct regular property inspections, as hoards tend to grow over time. Professionals who treat hoarding disorders remain optimistic that the condition can be controlled in many cases. However, it is critical for landlords and property managers to have firm guidelines as to what hoarders can and cannot do. For instance, items cannot be stored near windows, doorways, stairwells, or near appliances or vents, no perishable or combustible items can be hoarded, and the hoarder must remain able to use rooms as they are intended. Stressing the safety concerns may help the hoarder comply with the rules. Because hoarding is such an emotionally sensitive issue, experts at Address Our Mess suggest a compassionate approach may yield the best results. Talking with the hoarder and encouraging compliance rather than levying threats may help to avoid an eviction. Some community resources which offer assistance to the hoarder are willing to serve as liaison with landlords in order to salvage the tenancy. Unfortunately, if the hoarding cannot be controlled, an eviction may be warranted to avoid liability for injury or damage to the rental property. Hoarding in Ontario can be a big problem for landlords. We are held responsible for the hoarding tenant’s actions but don’t have the legislative tools to deal with the problem. For instance, although the fire dept is very much aware it is the tenant that responsible for the hoarding, the fines and infractions are given to the landlord. The Ontario human rights commission can regard hoarding as an emotional condition and therefore “protected” by the human rights housing policy: requiring the landlord to “accommodate” (resolve the hoarding problem and seek medical attention for the tenant). The landlord is responsible for all associated costs of “accommodation”, to the point of the landlord’s personal “financial hardship”…..as determined by the human rights commission. Combine this with the tenant’s ability to refuse the landlord entry (despite the landlord giving proper written notice ) and the landlord’s only recourse to apply to the landlord tenant board for access (a process which may take several months) and one can see how a hoarding tenant can literally cause financial ruin for a small Ontario landlord.